For the topiary lover, this set of 4 different topiaries (a rose topiary as pictured here, a "flowering egg" topiary which is perfect at Easter, a green garland and red bow wreath topiary ideal for Holiday Displays and a "flowering fruit" topiary) and a stand will let you change the look from season to season. 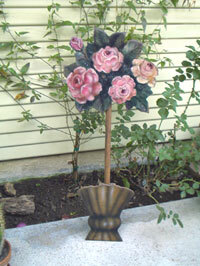 This set has been retired, but we still come up with a few from time to time for "planting" in new gardens. Each Boardwalk Originals piece is hand painted, signed and dated by the artist. A three step process is applied to the painted wooden figure including air brushing to produce a natural time worn appearance. Removable sturdy brace included ~ also makes for easier storage.